Now back away from that box of same-old pops. 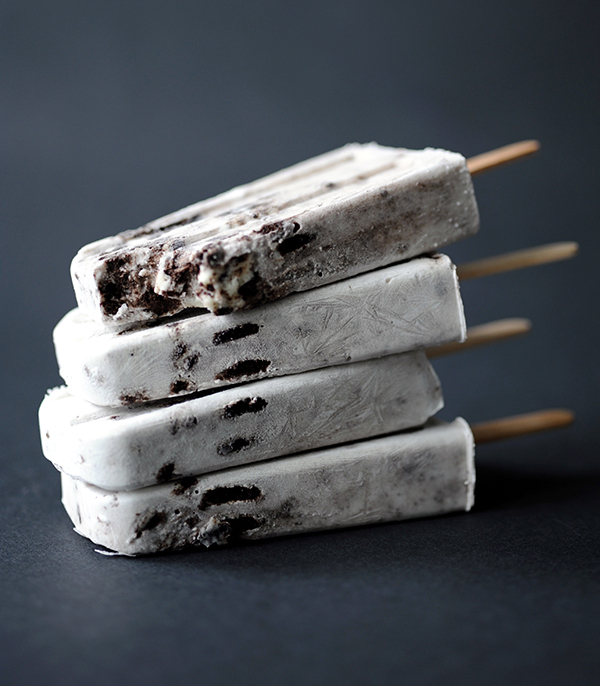 These surprising DIY popsicles prove that it’s easy—and cool—to be different. As kids, no summer was complete without some Bomb Pops or Fudgsicles from the ice cream truck. But delicious hot-weather popsicles aren’t just for the kids. These inventive homemade frozen desserts are perfect for your next al fresco party. You’ll never settle for store-bought ice pops again. 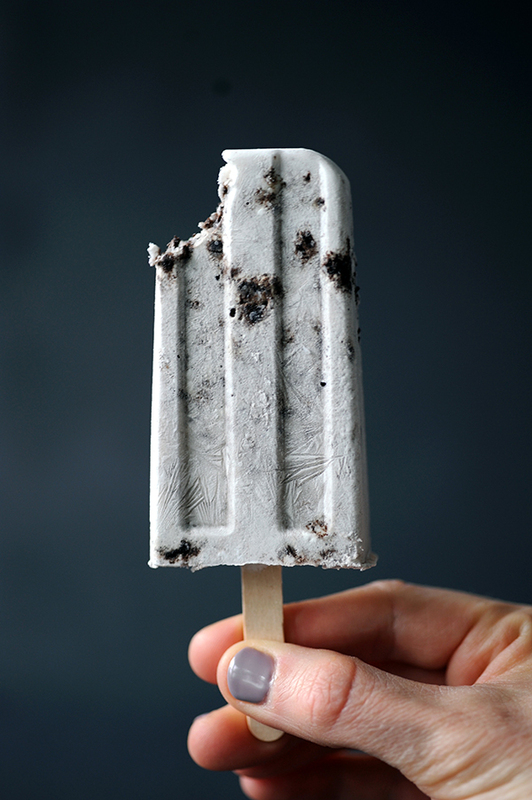 This vegan pop is a decadently creamy yet dairy-free option. Coconut milk freezes hard and doesn’t get icy like milk based popsicles. It is also high in healthy fats so you can feel good about eating it. Shake the can of coconut milk well. Pour it into a small mixing bowl and add vanilla, whisk until completely combined. Take 6-8 cookies and crush them by placing them in a small food processor. Fold the crushed cookies into the coconut milk,being careful not to over-mix. Spoon a small amount of the mixture into the bottom of 5 popsicle molds. Insert a whole cookie into each of the molds. Fill the molds with the rest of the cookies and cream mixture. Carefully insert a popsicle stick into the molds, the stick will fit right into the filling of the cookie and stand by itself. Freeze until solid (overnight is best). To remove the popsicles, run hot water on the outside of the mold for about 20 seconds. Pull popsicles out and serve. 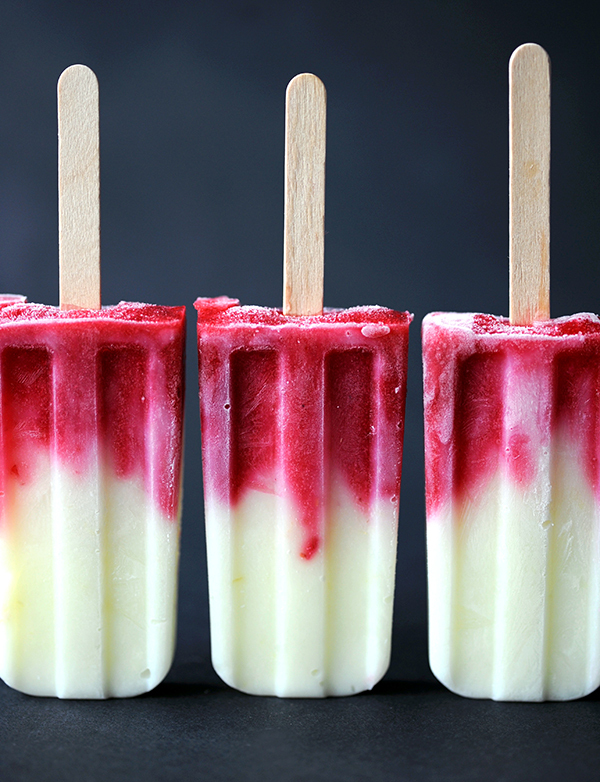 Lemon infused vanilla yogurt swirled with sweet fresh raspberries and frozen into a popsicle is the perfect summertime treat for kids and adults alike. Place fresh raspberries in a fine mesh strainer and press with a rubber spatula, continuing to stir and press until all the juice is in the bowl and only the seeds and some skin remain in the strainer. Discard seeds. Add the granulated sugar into the raspberry puree. Stir to combine. Set aside. Scoop the yogurt evenly into four popsicle mold cavities. Pour the raspberry puree into each mold to reach the top. Using a knife or a skewer, poke the raspberry puree down into the yogurt mixture until it's mixed to your liking. Avoid stirring. Place the popsicle sticks or tops in. Freeze overnight until set. To remove the popsicles, run hot water on the outside of the mold for about 20 seconds. Pull popsicles out and serve. Aww, and I saved the best for last! In Key West they serve frozen slices of key lime pie on sticks dipped in chocolate. If you’ve ever had it, it’s not something you’ll soon forget. Here’s my nod to key lime pie on a stick and to those summertime Key West vibes. Whisk together key lime juice, lime zest, condensed milk, and half-and-half until thoroughly combined. Pour into popsicle molds and place the popsicle sticks or tops in. Freeze overnight until set. To remove the popsicles, run hot water on the outside of the mold for about 20 seconds. To make graham cracker crumble, combine graham crackers, sugar, salt and melted butter until you reach the consistency of wet sand. Press each side of the popsicles into the graham cracker crumble and return to freezer until ready to serve.